Remove the nerves and skin from the cheek, and season. Place whole in a cast-iron pot, lightly brown, remove and set aside. Lower the heat, and put the half a calf's foot (diced), vegetables and bouquet garni in the pot; braise gently. When the contents are nicely golden, place the cheek on them, pour the red wine on top, and cover. Put in the oven on a low heat for 3½ hours. During cooking, add a little water if necessary. At the end of cooking, the liquid should have reduced by half. Gently remove the cheek from the pot, and keep hot in a high-sided serving dish. Stabilising the sauce is quite tricky. Bring the sauce to the boil, and gradually whip in the blood. Sieve and serve with fresh pasta. Serve with a young red Châteauneuf du Pape from Domaine de Beaurenard. Bouquet garni, flour, olive oil. Carve the rabbit, roll the pieces in flour, brown in a pot, and set aside. Chop up the carrot, onion and shallot. Brown them in the pot with a soupspoon of flour. Prepare a bouquet garni. Put all the ingredients in the pot, and cover with the wine (+ 1 glass of vin doux naturel, sweet fortified wine). Simmer for 45-60 mins, depending on how old the rabbit is. Meanwhile, sauté the fresh mushrooms (you can also used frozen or dried ones). Once the rabbit is cooked, pass the sauce through a fine sieve and add the sauted mushrooms. Simmer for a further 15 mins. Serve with a Côtes du Rhône Villages Rasteau from Domaine de Beaurenard, 6+ years old. Break the chocolate into small pieces. Cut 250g of the butter into pieces. Pour a half-glass of water into a pot. Add the sugar and heat while stirring with a spatula. When the syrup starts to boil, add the chocolate pieces, then the butter. Turn the heat to low, and blend the ingredients until smooth. Turn off the heat. Pour the flour into a terrine dish, add one whole egg and blend. Then add the other two eggs, one by one, and blend well. Pour this mixture onto the chocolate/butter mixture and stir vigorously until all the ingredients are fully blended. Cut out a circle of wax paper the size of a bottomless mould (26-28cm wide). Rub butter on the paper (place it buttered side up) and mould. Pour the mix into the mould. Place the filled mould into another recipient (half as large again) full of hot water. Cook in this bain-marie in the oven for 1 hour at 170°C. Leave to cool, remove the mould, then sprinkle with icing sugar. Serve with a 1998 Vin Doux Naturel Rasteau from Domaine de Beaurenard. Place the lobsters in boiling water for 10mins, then shell the tails and claws. In a frying pan, gently fry the lobster in butter. Deglaze with the brandy. Add the veal stock. Meanwhile, wash, chop and sauté the mushrooms in a pan with some butter, then arrange in a serving dish. 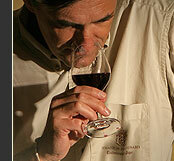 The sommelier's tip: Mr Marquet recommends a 1996 White Châteauneuf-du-Pape from Domaine de Beaurenard.